Thank you MissMelvis from Me Bookshelf and I for this lovely nomination. This is the 2nd award nomination for Bark Time. Thank You All! You get nominated – You accept the award – You write a post all about it including answers to 11 questions set by the person who nominated you and 11 facts about yourself. Then you pass it on. 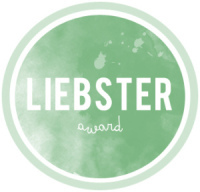 You in turn nominate 11 other blogs to receive The Liebster Award and give them 11 questions to answer. It’s aimed at up and coming blogs with less than 200 followers. 1. What 3 words would you choose to describe yourself? 2. Have you ever won anything? 3. What is the opening sentence of your favourite book? 4. If you could live anywhere, where would you choose to live and why? Not sure where it would be but I do know what conditions would be perfect for us – somewhere close to water, preferably the sea or an ocean, close to woods, somewhere were is not to hot (as Mark doesn’t like hot weather) but also not to cold – ideally place where you don’t need to own a winter jacket or a pair of snow boots, oh an a mountain in the distance..
5. What new thing would you like to learn today? 6. Which 5 people would you invite to your Dream Dinner Party? 7. What lesson did you like the most at school? 8. Who would play you in a film about your life? 9. What is the most wonderful time of the year? 10. What is your pet hate? 11. What is your number 1 sandwich filling? 1. What is your favourite free time activity? 2. Do you have any role models? 3. What would you prefer: book, theatre or a movie? 4. Which 3 things would you take with you to Desert Island? 6. What would you perfect family event consist of? 7. What is your way of relaxing or do you have any special way to vent out? 8. Which part of your daily routine couldn’t you live without? 9. If you could have any pet, what would it be? 10. When was the last time you hand wrote something longer than a note? 11. Internet – miracle/ useful tool or a waste of time? Out With The Old… In With The New! – Let there be light! Thank you again for nominating my memoir blog. Below are my nominations and responses. 1. What is your favorite free time activity? Reading, I’ve always been a book worm. Not in person. I started my writing career last year so I’ve been trying to read the best writers out there and learn from their experiences. 3. What would you prefer: book, theater or a movie? That’s a tough one. I suppose I can put them in my preferred order: book, movie, theater. A tool that will open coconuts. A book of Rilke’s poems. My iPhone it might just help me find my way off the island. 6. What would your perfect family event consist of? A big breakfast, followed by a long hike in a beautiful location. It’s hard to relax with a toddler at home, so I’m almost always busy but once a week, I allow myself some T.V. time, what I consider chewing gum for the brain. Hugging and kissing my hubby and toddler in the morning. I never had pets growing up so it would be a big adjustment for me to have a pet, but perhaps I would consider tropical fish. When I’m not at my laptop I write in a notebook. I also like to send cards to friends and family whenever possible. I think the internet can be both, it all depends on the user. Congratulations! I’m sure your Dinner Party with this guests would be great!